Cookies 'n Cardio: Me, StrongME, and Better'n PB Giveaway! Hello readers! I have not abandoned you, but somehow I managed to go 5 whole days without blogging. It's not because I've been without fabulous recipes and nutrition info to share... I've just been so busy sharing with some other fabulous people. Those people would be my 6th grade students at a local charter school in Memphis, TN! Recently, I was given the opportunity to fill in as a nutrition counselor at a wonderful 12-week family weight management program based here in Memphis. I met with children and their families to go over their food logs and share some healthy cooking and baking techniques. 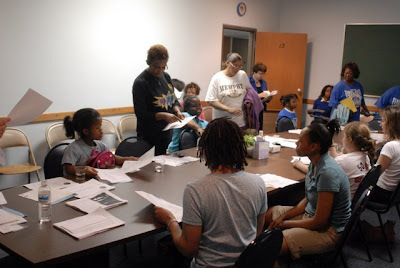 I was also able to discuss and answer questions they had about how to plan healthy meals when you're on the go so often. This amazing program was started by Dr. Janice Pride-Boone, a fabulous Harvard trained pediatrician, who saw the need for an intervention program for childhood obesity... one that involved the whole family. She decided to do something about it and started StrongME! Please check out their website, especially if you're a local Memphian and know someone who could benefit from participating in such a program. 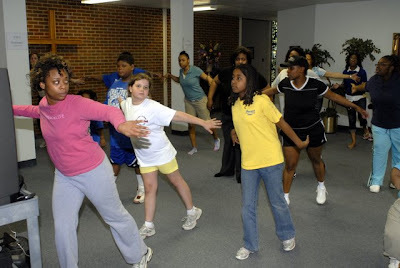 Parents & children participate in a group fitness class (such as Zumba) at the begining of each session - this photo is courtesy of StrongME! Nutrition discussion during a StrongME session - this photo is courtesy of StrongME! ﻿﻿﻿﻿﻿﻿All that to say, after my one night "gig" as a nutrition counselor, I was offered the opportunity to help StrongME crossover into the school setting. Last week I began going to one of the Memphis middle schools to talk to the 6th graders about nutrition and healthy living. I'll be doing this about twice a week for the duration of the fall semester and spring semester as well. I couldn't be more thrilled! During the first week, I introduced the idea of nutrition and healthy living. Dr. Pride-Boone was also on hand to tell them about pediatric obesity and the consequences of it. What I found to be shocking was that she actually had a patient who ended up having their gallbladder removed due to complications with obesity! That's the type of surgery that obese adults are having!) 12% of adults that is, and after having a solid a 50 years WITH their gallbladder! If you're interested in reading more about obesity and gallbladder disease, check out this article over at Obesity Action Coalition. Most recent report of childhood obesity, "F as in Fat: How Obesity Threatens America's Future 2010." ﻿﻿﻿﻿﻿﻿If you know me, then you know that I have a passion for nutrition, especially in nutrition education for children. 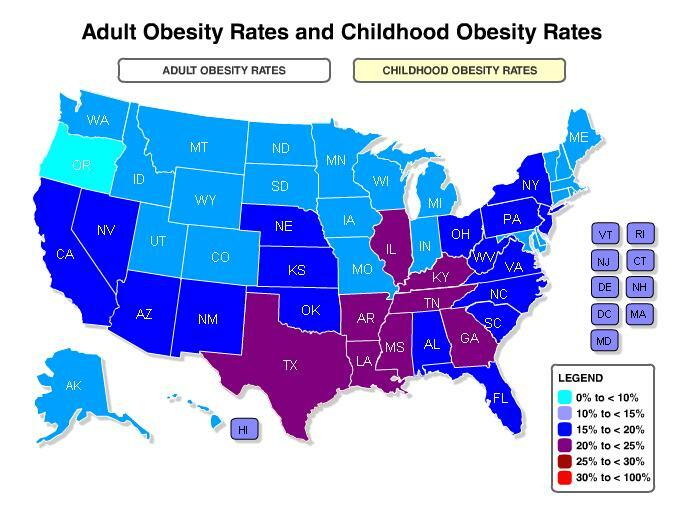 You would think that nutrition and health would be a mandatory class given the skyrocketing obesity rates that continue to grow at an alarming rate. Unfortunately, health and nutrition aren't on the report card that little Suzie takes home... therefore why would Suzie's teacher take time away from teaching science, math, social studies, etc to teach something that isn't covered on those very important tests which school's funding is based upon? I'm not blaming Suzie's teacher for this... but until legislation gets passed requiring a graded wellness course, that aspect of education gets set aside. If you agree with me... that health and nutrition education should be required, then make your voice heard in your state! Find out how over at the Health Education Advocate. ﻿﻿﻿﻿﻿﻿﻿﻿﻿﻿﻿﻿﻿﻿﻿﻿﻿﻿﻿﻿﻿﻿﻿﻿﻿﻿﻿﻿﻿﻿﻿﻿﻿﻿﻿﻿﻿﻿﻿﻿﻿﻿﻿﻿﻿﻿﻿﻿﻿﻿﻿﻿﻿﻿﻿﻿﻿﻿﻿﻿﻿﻿﻿﻿﻿﻿﻿﻿﻿﻿Ok! I'm off my nutrition education soapbox! I thought I'd share some of my favorite techniques for healthier cooking and baking. These are the exact same tips I shared with the parents at StrongME a few weeks ago! Make healthier mashed potatoes by adding Greek yogurt instead of fattening sour cream. You'll still get the creamy texture without all of the fat. Holy Guacamole! Add ½ cup of plain 0% Greek yogurt for every whole mashed avocado that you use in your favorite guacamole recipe for some an added protein punch at your next fiesta. Slice sweet potatoes lengthwise into wedges, toss with cracked pepper and drizzle with olive oil. Bake at 450 degrees for 30 minutes (tossing occasionally) until tender and golden brown for a delicious side item of sweet potato "fries." For the taste of fried foods without the calories, trying using Panko Japanese bread crumbs as a crispy, crunchy coating. Substitute unsweetened applesauce for oil in any baking recipe. This will dramatically cut the fat and calories, and will leave you with a moister brownie or cupcake than any amount of fat could try to accomplish. Don't feel that you should follow every recipe exactly! Feel free to decrease the amount of sugar in a recipe. Try substituting some of the amount with agave nectar, which is much lower on the glycemic index and twice as sweet as sugar… which means you can use less! Bake without breaking… an egg! Use liquid egg whites (available in small cartons in the egg section at the grocery store) in place of whole eggs for zero fat and zero cholesterol. Added bonus… no worrying about egg shells getting in the batter! By toasting nuts, you can bring out a stronger flavor… therefore you only have to use half the amount and still get the nutty flavor that you desire. That Red Hot Chili Peppers song just popped in my head. Not sure why. ACTUALLY... it could be because I'm hosting my first blog giveaway! Wanna know what it is? Well, you know that peanut butter that I'm OBSESSED with? Ya know, the one I wrote about here and here... The kind folks over at Better'n Peanut Butter were so happy that I had been spreading the peanut butter (no pun intended) love around, that they wanted me to able to share it with my fabulous readers! They put PB on a diet... and it's oh-so-good! There was 1 jar of Original Better'n Peanut Butter AND 1 jar of Chocolate Better'n Peanut Butter! Now I haven't been able to find the chocolate variety in my home town, so I was so tempted to keep this one for myself. But I love my readers too much :) So... the winner of this giveaway will receive BOTH jars of Better'n Peanut Butter! This giveaway is Vegan and Anti-Gluten friendly... both products are dairy free and gluten free! Cheers! To enter just leave a comment on this post and tell me... what is your favorite way to enjoy peanut butter? If you win, you'll be able to REALLY enjoy it, because Better'n Peanut Butter contains 85% LESS fat and almost HALF the calories of your normal jar of PB! Hello... I'm hungry. I'll pick a winner using a random number generator on Wednesday. Last chance to enter will be Wednesday, October 27th at 6pm (central time.) Good luck! That's so great that you are working with kids. I really wish that when I was in school there had been more nutrition education in my public schools. Perhaps it would've helped me to make better choices! A nut butter give away? Count me in! My favorite way to enjoy PB (or any nut butter) is in oatmeal. Can't beat it! I really do love your blog Laurie! Umm your pug is the cutest thing ever haha. peanut butter cookies, peanut butter in smoothies, peanut butter on a SPOON... :D I like peanut butter !! I wanted to try Better'n Peanut Butter so much! If I get it and it's good, I'll definitely keep buying it! I just love peanut butter and a little jelly on toast as a great breakfast. :) PB in oatmeal was so good too! Only way I can eat oatmeal w/o feeling nauseous (I'm serious, lol). For anyone who has been tempted to try Better'n Peanut Butter, but just has not yet.... DO IT! And do it now! It is unbelievably fantastic and oh so creamy! Ok anyhow A) You are such a good person for giving away your chocolate Better'N Peanut Butter. I would not be so generous. B) I literally laughed out loud at Teddy's Costume...now I wish I had bought the Lobster Costume for Minka....ugh. I love peanut butter in my infamous fruit/spinach smoothies . . . I'll donate my PB to Liza if she wins! Wow... I wish you lived here in Southern California so you could come to my junior high health class as a guest presenter. I love PB. Period. I love it with jelly on sandwiches, I love it on club crackers, I love it on a spoon for a quick snack on the go, I love it on oreos... which I haven't done in a really long time. Did I mention I love peanut butter?? Ok, you've convinced me. As soon as I'm done with my Jiff Natural PB, I'm going to try and find some of this Better'n PB :) Do they have it at Kroger?? Hmm...favorite way to enjoy Peanut Butter?! In a Reeses! LOL I make an AMAZING PB Mocha Health Shake that is one of my "feels guilty, but really isn't" pleasures. LOVE me some PB. pb & j---i can not get enough!!! I love pb in just about everything but my favorite would have to be in brownies.